What a splendid concert! Thanks to all for being part of it – from the great start of the Piccolos to the end, massed orchestra. I enjoyed the whole evening so much. What a great job Virginia is doing in developing ensemble skills. The age range is heart warming to see and the pieces well rehearsed and musically performed. I enjoyed hearing it all. Intermezzo Strings, you did such a good job on the variations, I was so proud of the way you all worked and learned this piece which stretched everyone. In the end it all hung together and sounded great, and I’d been a bit concerned about a couple of the variations as you would know. LSO, I just had fun! When ‘it works’ an orchestra is quite improvisatory – what I hear, I can work with and so our music is not just what we rehearsed, but a new creation, born of this concert. That’s a huge thing to have succeeded at. The LYCO just keeps improving, we are all building this orchestra, even those of you who apologise for making mistakes or feel you aren’t good enough. I’m not certain why what we do works, but it does. Your loyalty and hard work are like me getting a better instrument, it suggests things and creates opportunities for musical things just to happen, you’re teaching me to be a better conductor all the time, so thanks! Have a great summer break and we’ll look forward to more of the same next year. All three of of the LYCO’s constituent orchestras will perform at this concert: the Piccolo Strings, Intermezzo Strings and the Launceston Symphony Orchestra. Highlights will include three movements from the ballet “The Seasons” by Alexander Glazunov and the combined orchestras playing the “Canon in D” by Johann Pachelbel. 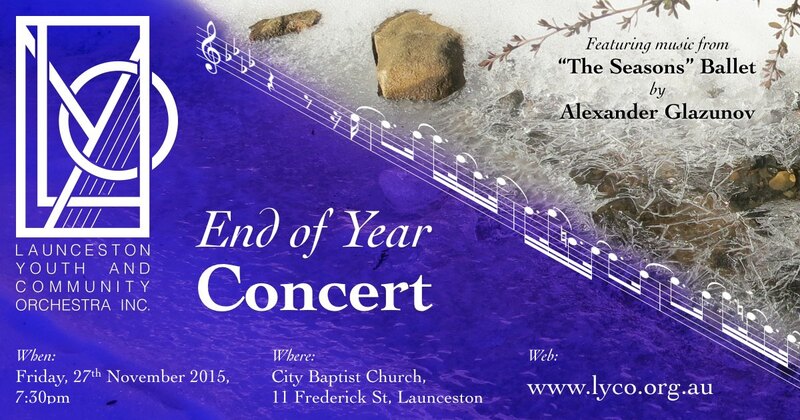 This concert signals the end of the year for the LYCO. There are no rehearsals in December or January. The first rehearsal in 2016 will be on Friday, the 12th of February.